Almost everyone knows that being a parent is an important job… and almost everyone can use a little guidance. Our home visitors bring a lot of knowledge and a great attitude to working with you and your family members. • Stay healthier and feel better while you’re expecting. • Learn how your baby develops before birth and afterward. 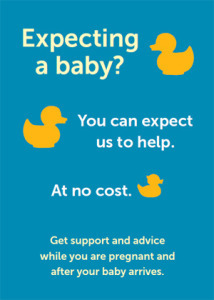 • Get the right care for you and the baby. • Understand how to respond to your baby’s cues, such as crying and fussing. • Make being a parent fun, from feeding to bath time. • Focus on your own goals, from education and work to being the best parent you can be! Pregnant women and families with children under three months, living in the Middletown 10940, 10941, or Newburgh 12550 zip codes may apply.